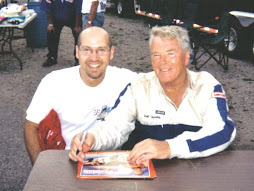 Dean and I went on a great road trip for the Speedtalk TV show in June of 2005 to an ASL (American Stock car League) race at Hawkeye Downs in Cedar Rapids IA. The ASA National touring series had just dis-banded and the ASL series utilized the same ASA cars and rules package. Unfortunatley the series only lasted one year. Dean and I had access to all the drivers before and after the race. We interviewed: Tim Olson, Trevor Stewart, Jarit Johnson (Jimmie's brother), Andrew Morrissey and a 15 year old Landon Cassill. 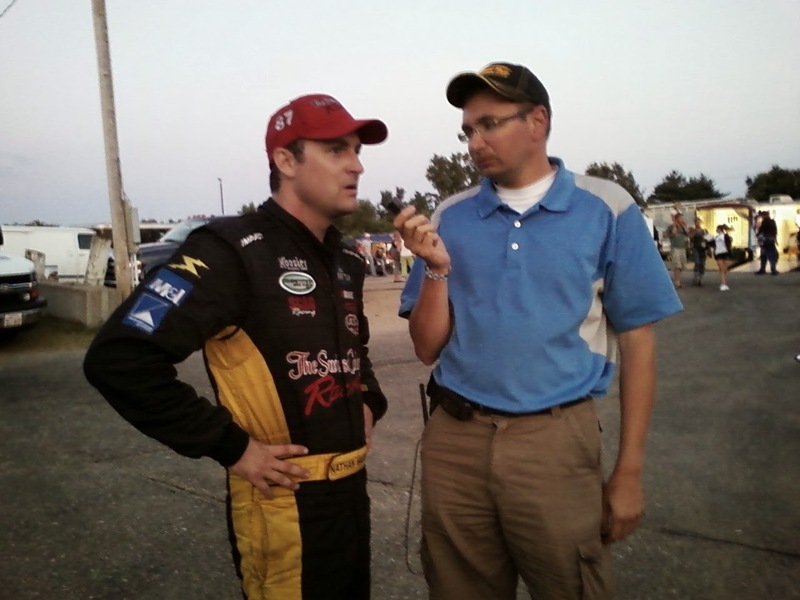 Stephen Leicht won the race and this Youtube video is an interview we did with him in victory lane. 2010 should be an interesting season. With Aric Almirola being placed in the #09 car for the entire season and Brad Keselowski in the #12 car with Penske, I see an interesting battle with those two! Brad is going to be under the microscope to bring the #12 back to the glory days of old, (sorry Mr Mom)! Eric will have to prove that he is what the hype about him in the past is correct, and not just a "flash in the pan." 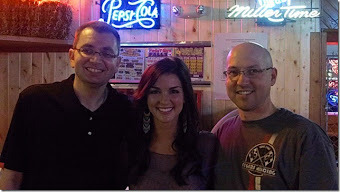 My jury is out on Danica. I truly don't know that she can bring to the table what NASCAR and Junior are hoping for. 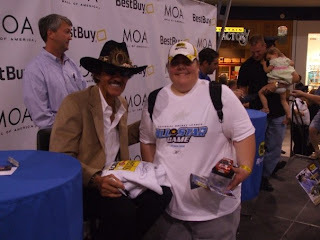 As those of us fans know, Indy and NASCAR are worlds apart and it takes a very special driver to make that transition. Yes Jeff Gordon, Robbie Gordon, Ryan Newman and Tony Stewart made it look easy, but guys like Hornish, Carpentier and Franchitti showed that while there could be some brilliance, for the most part, Indy is where they belong. 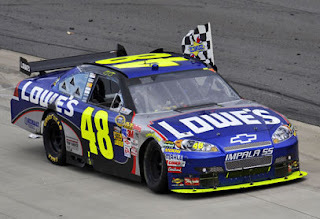 That being said, I see the Hendrick dominance continuing. I don't see anyone being able to stop Jimmie Johnson, however with shining hopefuls in Brad (Keselowski) and Joey (Logano) showing off their skills, maybe the changing of the guard is in the future. I don't see Junior winning the championship this year and I fear that if he doesn't win it within the next 2-3 years, he never will. Kyle Busch still has the potential but needs to bring his attitude in check, until that happens, no cup championship for him. *Cathy was a regular contributor to KFAN Motorsports, you can find her most summertime Saturday nights at Elko Speedway . The Lou Fegers racing annual winter swap meet is coming up Friday and Saturday (Jan 29 & 30). Come on down for good deals inside and outside 8am-5pm on Friday and 8am-1pm on Saturday. The Monster jam at the Metrodome in Minneapolis featured 18 trucks taking to the new Mall of America field inside, as the cold rain poured outdoors. Maximum Destruction won the racing portion of the show beating Avenger in the finals. 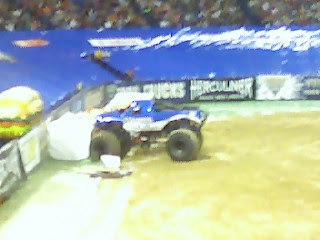 Grave Digger was out in the semi-finals. Albany MN racer Paul Strong in Martial Law broke in the introductions, so he was out for the racing but came back for the free-style. He did a crazy slap-wheelie and slammed into the wall, thrilling the crowd. Jim Koehler driving Avenger was the big winner in free-style. The crowd exploded and jumped to their feet when he rolled over and got back on his wheels not once, but twice! 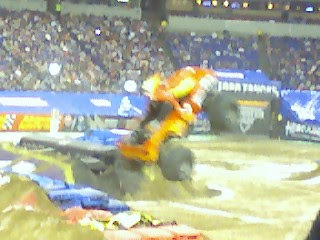 Grave Digger driven by Randy Brown tried to follow Avenger but couldnt quite capture the same energy as usual. He hit some big jumps but did not tear-up the truck. Tom Meents with Maximum Destruction lived up to his name... he cross-threaded a massive jump and rolled... tearing the entire body of his monster truck off, then continued to hit jump after jump leaving the crowd in a frenzy of excitement. As the scores were posted, some people seemed in shock that Avenger held the top spot, edging Maximum Destruction by one point and Grave Digger by two. Advertise on "Speedtalk on 1360"
A great way to support Motorsports in Minnesota and target the loyal race fans in this area. Advertise on "Speedtalk on 1360" .. You will get 2 sixty second advertisements during the radio show on KRWC 1360am Saturdays from 10-11am .. PLUS numerous name mentions during the week on promo's. We can also help you reach thousands of motorsports fans by posting your event listings for free on our web-site http://www.speedtalkon1360.com/ also on our Faceboook Fan page and Twitter. 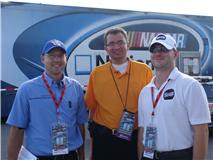 In 2009 we interviewed 34 of the top drivers from all over the Midwest, 2010 will be bigger and even better. We start the show on Daytona weekend, Feb 13th! We cover the ASA Midwest tour better than anyone, plus local dirt and asphalt racing. Jason Searcy and Dean Reller are back as hosts of the show. 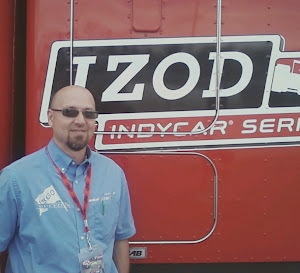 Jason has over 14 years of announcing experience at local race tracks and has hosted a racing radio/TV show since 1991. 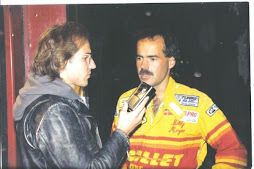 Dean is an experienced Pit Reporter, motorsports writer and track official. He has done radio/TV for ten years now. 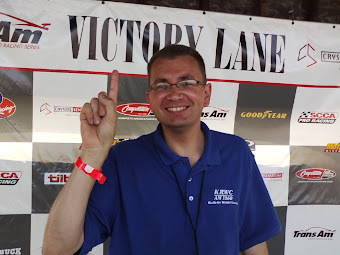 Dan Plan, editor of the Midwest racing connection, joins us to update the Minnesota local racing scene. Advertising on "Speedtalk on 1360" is very affordable: $50 per week..
For more information please contact Jason Searcy at speedtalkon1360@live.com or Joe Carlson at joe@krwc1360.com or call (763) 682-4444 and ask for Joe. 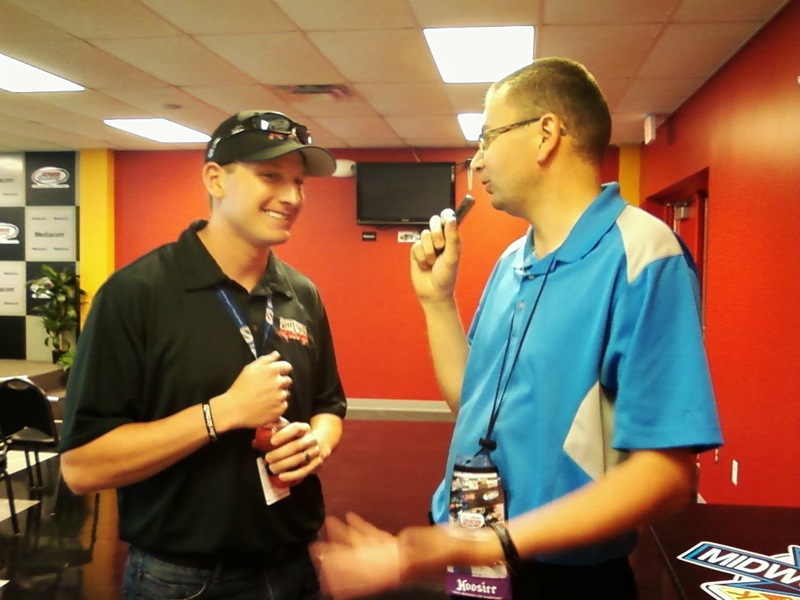 Please help us keep Motorsports exposure on the radio possible! Four ASA Midwest tour races will be broadcast on Fox Sports North in Minnesota. One of the four chosen races is the June 5th race at Elko Speedway. The race will air tape-delayed on TV two weeks later at 11am on Saturday morning (immediately after Speedtalk). Jim Tretow will be doing the race call, Jana Jurkovich doing the pit road and victory lane coverage and Bill Holland will co-host. 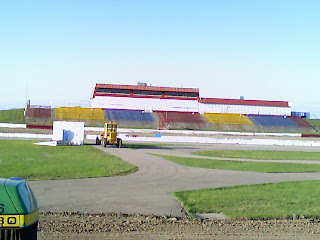 I-94 Raceway was changed back to a dirt track a year ago after 15 years as an asphalt track, and it was renamed I-94 Speedway. 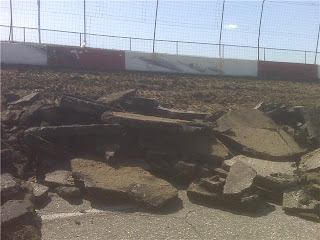 I heard that the backstretch concession stand was tore down last week, I dont know why. I know Tim Olson has nothing to do with it, he is out of the picture. I will post if I hear anything else. 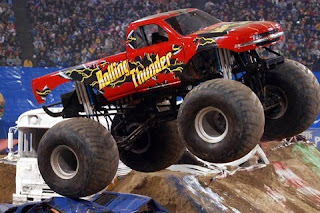 Monster Jam is coming to the Minneapolis Metrodome on Saturday January 23rd. 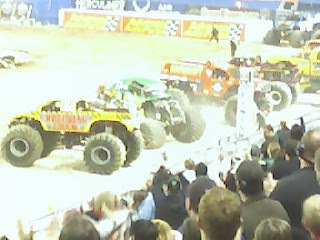 You can see the huge mega-star trucks "Maximum Destruction" and "Grave Digger." Two great Minnesota drivers will have a chance to thrill the 50,000 fans at the dome too. Jim Bendzick from Faribault MN driver of "Rolling Thunder," who is the KING of the cyclones, a monster truck version of the donut. Paul Strong from Albany MN drives Martial Law. Two top-notch Minnesota drivers to watch if you are going to the dome this weekend. 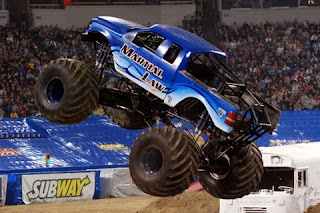 Monster Jam is Saturday night (January 23rd) doors open at 5:30pm, show begins at 7pm. 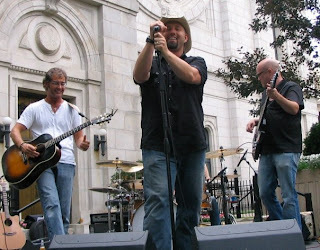 Former KFAN Motorsports host and singer for Rocket Club pickes Tony Stewart to win the 2010 NASCAR Sprint Cup championship. I think a handful of drivers could do well in 2010. Of course you're going to have the Hendricks Motorsports drivers besides maybe Dale Jr, who could struggle a bit. The Joe Gibbs Racing drivers should do well and a couple others. When it comes down to it, I think Kevin Harvick is going to do well. 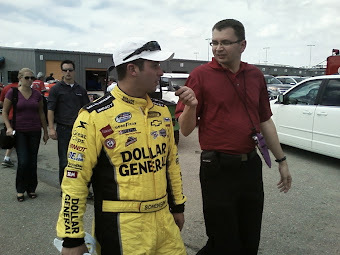 Richard Childress racing has finally figured some things out at the end of 2009 and I think that will continue into 2010. When I look at what Kevin Harvick did at the end of the season last year, it seemed like things really clicked into place for him. Kevin Harvick can get it done, and with this upcoming season being his last year of the contract with Richard Childress racing, he is likely to be more motivated to get good results. Yes, you can say its because he is in a contract year, but I think he wants to forget what happened at the beginning of 2009 and continue what he was doing the last few races of 2010. Not to mention that he wants to prove that he can still run well and win some races. 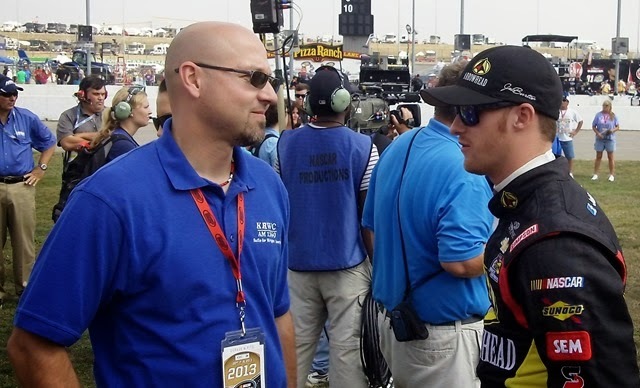 Maybe even attract a contract somewhere, whether its at RCR or at another organization that is looking for a driver. Maybe Stewart-Haas if they decide to add another car or two. Hopefully RCR can continue what they were doing late last season into this year and not go down the wrong road, like last off-season. With the improvement of what RCR is building and the motivation that Kevin Harvick is more than likely to have this season, I expect him to perform better. Don't just look for Harvick to have a good season at RCR, keep an eye on his teammates Clint Bowyer and Jeff Burton. I wouldn't be surprised if they do well this season, in addition to Kevin Harvick. 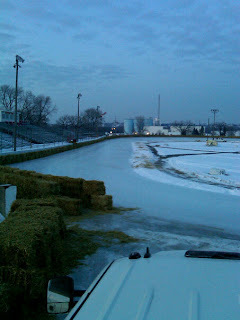 Raceway Park in Shakopee (MN) will be having vintage snowmobile ice racing around the oval on Saturday January 16th from Noon-3pm. Paul Hartman's father Craig Hartman 53 of Willmar MN, died Friday at St Cloud Hospital after a car accident. Memorial services will be at 1:30pm Thursday (1-14-2010) at Calvary lutheran church. Friends may call Wednesday from 5-8pm at Harvey Anderson funeral home and on Thursday one hour prior to the service at the church. 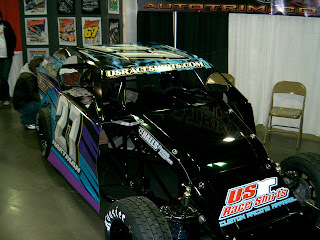 The picture is of Paul Hartman's Mod 4 car at the WISSOTA Expo. 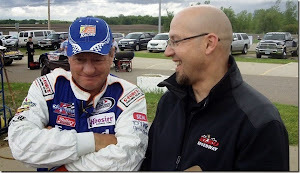 Dean and I spent time with Craig and Paul when they raced Legends cars at I-94 Raceway. Both great people, Craig will be missed by many. The ASA racing website has put together a new "ASA Minute" update. Check it out, they will explore different topics including a bunch of stories on the upcoming ASA race in South Africa. The History Channel has a new show focusing on four different Modified race teams at Bowman Grey racetrack in Winston-Salem North Carolina. It will air at 9pm Sunday nights on History Channel. Its a very unique 1/4 mile flat track in a stadium.